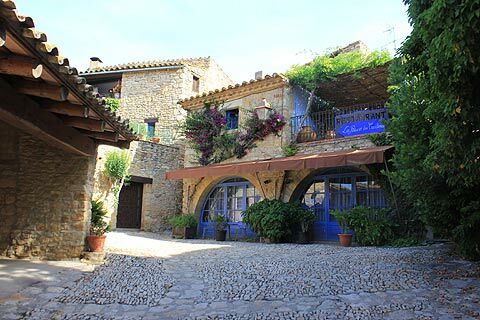 Peratallada is in the province of Girona in the Catalonia region of Spain. 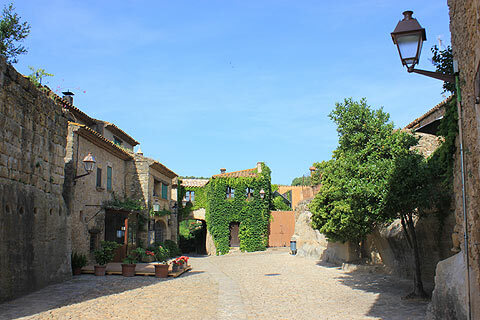 This lovely village is carved of stone from the moat which surrounds Peratallada. Indeed its name means 'carved stone'. Defensive walls surround parts of the village and there is also a stone castle. It was one of the best fortified medieval villages in Spain. Nowadays it is considered to be one of the most beautiful villages in Spain. It has a maze of narrow streets and sunny squares, various towers punctuate the skyline and an 11 - 14 th century palace. As you wander through the maze of narrow streets the beautiful stone houses are a constant source of admiration. The streets regularly open out into sunny squares usually with a bar or cafe allowing you to linger and enjoy the moment. 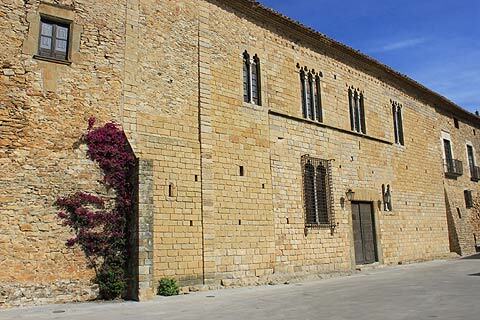 Peratallada is a classified historic site and is one of the most important medieval centres in Catalonia. The castle of Peratallada has two main towers, one of which is particularly huge. Looking at the castle you can clearly see that it has been built over two different time periods. The older part is simpler and fortified and the newer part more of a palace than a castle The castle is now a luxury hotel and restaurant. 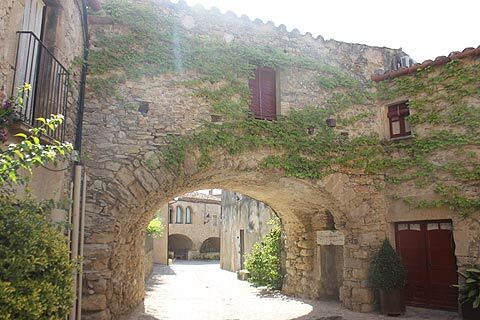 The castle of Peratallada was built in the 11th to 14th centuries and is made up of a number of buildings surrounding a courtyard. These include the old hospital, the old prison and two tower. There is also the gateway of the virgin - named after the statue of the virgin that would have resided in the cavity for it built into the gateway. The Torre del Homenaje tower situated in the middle of the castle's fortified walls is the most visible part of the village and is 10 meters high. The Western tower is open to the elements and its arched interiors fully exposed to view. 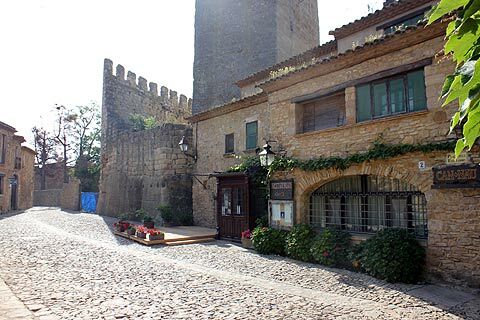 There are three other towers in Peratallada - the Torre de las Horas, or clocktower and the Torre de Planta Circular at one of the entrances to the village. This is the only circular tower in Peratallada and is also about 10 meters tall as is the north tower - the Torre Norte. The Place de les Voltes is the main square and is surrounded by arcaded buildings. The original medieval arcades are half-hidden inside the buildings as the buildings were extended out and over the top of them. The moat surrounding the village can be best seen near to the Portal de la Virgen - the gateway of the Virgin. They are about 7 meters deep in this area . Unusually the church sits outside the main village. Rumour has it that this is due to an argument between the priest and the lord of the castle. The church is a 13th century Romanesque church and with its long tree-lined entrance area it is particularly attractive. Its bell-tower is more of a flat bell-wall and is a style which is quite popular in the Lot-et-Garonne region of France. 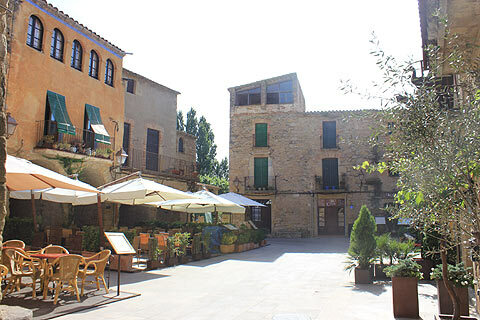 There are lots of galleries, restaurants and small hotels in Peratallada and its closeness to the beaches of the Costa Brava make it a popular spot and a good base for exploring the Baix Emporda region. The selection of restaurants make it a particularly good spot to come in the evening and sit in one of the picturesque squares or charming streets to dine 'al-fresco'. The Costa Brava coastline and its resorts are nearby. Nearby Begur is one of the nicest coastal towns on the Costa Brava. Pals is a lovely medieval walled town with one of Spain's top golf courses. Northwest of Peratallada is the medieval village of Ullastret and the ruined Iberian settlement of Poblat Iberic d'Ullastret and its museum.